Remember making friends in the lunchroom? For many of today's teens, friendships can start online. A just-released report from the Pew Research Center finds 57 percent of teens have met a new friend online, and nearly 29 percent say they've made more than five friends in digital spaces, like Facebook or via online games. Researchers surveyed more than a thousand teens ages 13 to 17, in English and Spanish. They found most friendships that are made online, stay online. Only one in five teens have actually met an online friend in person. Where in the digital world do teens meet new friends? Among boys who have made a friend online, video games are a hot spot -- 57 percent made a friend while gaming over online networks. As for girls, 78 percent who made a friend online met on a social media site like Facebook or Instagram. The report also finds that the majority of teens on social media use it as a way to stay connected with the friends they already have. Seventy percent say it makes them feel more connected to their friends' feelings. But there are challenges. Most (88 percent) of teen social media users believe people share too much information about themselves. Teens also report feeling pressure to post content that makes them look good to others, and having had someone post things about them that they can't change or control. Still, not all interactions are virtual. "Teens still spend substantial amounts of time with friends in-person, especially at school," said Amanda Lenhart, Associate Director for Research at the Pew Research Center and the lead author on the report. In a press release Lenhart noted, "But mobile phones, social media, and for boys, online video gaming, have become deeply enmeshed in creating and maintaining teen friendships. In many instances, these technologies makes teens feel closer and more connected to their friends." As for the top way teens stay in touch? 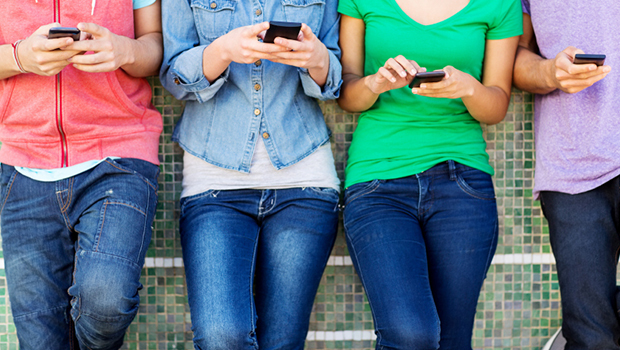 That's no surprise -- the report finds 88 percent of teens text their friends, with 55 percent of those texting daily. But you might think twice before trying to reach a 13 to 17 year old via email: Only 6 percent of teens report emailing with friends every day.